The Wilson High girls water polo team. A shift in the California Interscholastic Federation (CIF) schedule to accommodate state playoffs has high school sports starting earlier than ever—so early that all of the Long Beach high school winter sports will play multiple Moore League games before the Christmas break for the first time. 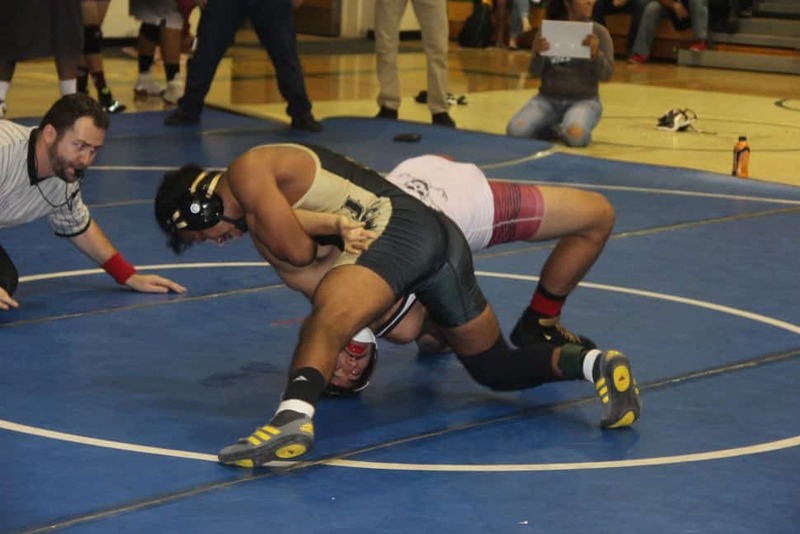 Most basketball, soccer, water polo and wrestling coaches said they would rather play the important league games later in the season after completing tournaments surrounding the holiday break. Some teams like Long Beach Poly and Compton boys’ basketball have rescheduled their Dec. 14 league game for later in January, but that’s just one of the many interesting storylines that run throughout local winter sports this year. For the first time since the CIF Southern Section adopted the playoff equity format, there are four Long Beach teams from two high schools in Division 1. It’s not surprising that the Poly boys’ and girls’ teams are in the top division, but it is a great accomplishment for St. Anthony to be in the same situation. “I’m proud of where we’re going,” said St. Anthony boys’ basketball coach Allen Caveness. When he took over the program four years ago, the Saints were in Division 4. Caveness has a trio of four-year players leading the way for his team in Frank Staine, Josh Belvin, and Marquise Nelloms, and said he wants to play more local games to be able to compare his squad against the best in Long Beach, including Poly. 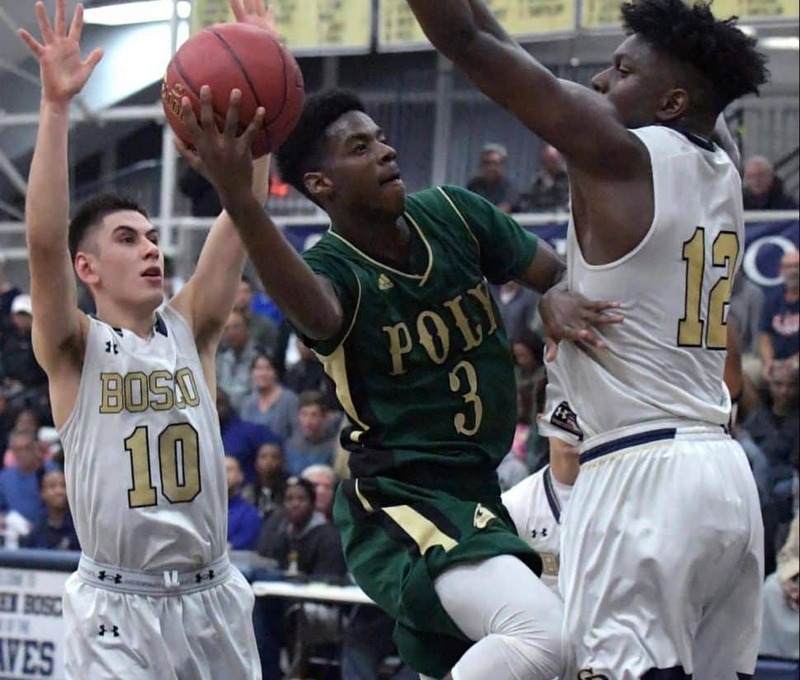 The Poly boys’ basketball team is an underdog among the private schools in Division 1 yet again, but the Jackrabbits have experienced game-changers in Giordan Williams, Justin Rene, and Malik Salahuddin returning. Sixth-year coach Shelton Diggs said he has high hopes for this team, and wants them to reach the Open Division playoffs with the other top seven teams in the section. “We’ve made state every year I’ve been a varsity coach and I want to continue to do that,” Diggs said. Both Poly and St. Anthony girls’ basketball teams have been in the top division for years, and both have multiple CIF championships within the last decade. This year, the Jackrabbits are a run and gun team behind senior Deja Williams, the reigning Moore League Player of the Year and a Cal State Northridge commit. The Saints are starting a new era under first-year coach Ray Bennett with the talented twin guards Kali and Kaila Murrell leading the way. The new field turfs at Wilson, Poly and Cabrillo will change Moore League boys’ and girls’ soccer forever. The league has been known for its unstylish play on bumpy natural surfaces with games routinely rescheduled after rains turn the fields into mud. 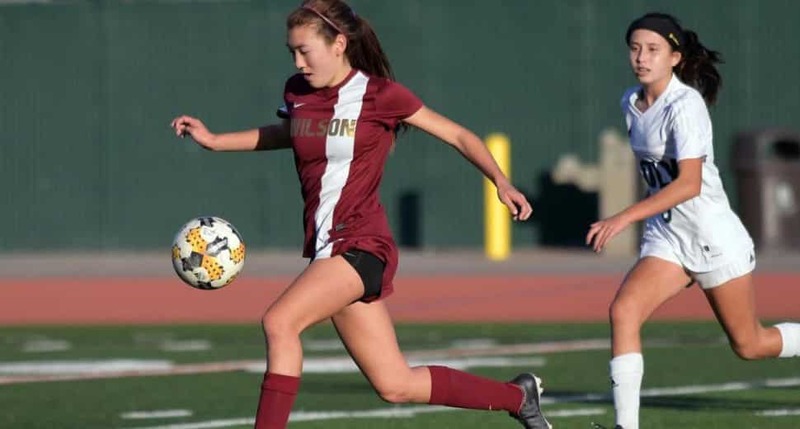 The defending league champion Wilson girls probably wouldn’t be able to host Millikan if they were playing on their old field after the rain this week. Instead, coach Dalton Kaufman is excited to see his team connect passes and play a patient stylish game on the new field turf. On Tuesday, Wilson visited Lakewood where they Lancers haven’t had field turf installed yet, and Kaufman had his team play more direct like they did last year in order to get the 3-0 win. Millikan is scheduled to host Poly in the season finale on Jan. 31. The Millikan boys’ and girls’ wrestling teams are the favorites to repeat as league champions because they’ve done it every year since 2011, but the local title chases could be closer than ever. After a few defending league champions left the program in the offseason, the Millikan Rams only have four total returning All-Moore League wrestlers. Even Millikan 28-year coach Marshall Thompson doesn’t know what to expect. Thompson’s sons Trevor and Sean will be two of Millikan’s returning league champions alongside junior heavyweight Edwin Samayoa. On the girls’ side, Isabella Moreno is the only returner with a title under her belt. Meanwhile, both teams from Wilson and Poly have been steadily improving for the last few years, and hope they have a chance to upset the Rams. Wilson hosts Millikan Thursday at 5 p.m. in the league opener. The Wilson girls’ water polo team is a defending CIF-SS champion for the first time in school history, but the Bruins aren’t the defending Moore League champion for the first time since 2006. Last year, both Wilson and Poly reached CIF-SS championship games in February just weeks after the Jackrabbits beat the Bruins to win their first ever league title. Wilson ended up winning the Division 3 title, while Poly lost to Segerstrom in the Division 4 final. “The girls are very proud of what they accomplished last year, and they’re still hungry this season,” said second-year Wilson coach Barry O’Dea, who returns almost his entire championship squad. Wilson is scheduled to host Poly at the Belmont Outdoor Pool on Dec. 20.